I received some games for Christmas. Here’s the haul. plus Call of Duty: World At War & Halo: Reach for the 360. There’s a whole lot of gaming going on! We had a game day on the 11th of December. After more than a month of scheduling issues, Gameathonapocaloozafestacon #1 happened. Terry and Cindy arrived, ready to game, about 1pm. I had prepped a couple of scenarios for Dread because Terry had requested it. He brought Heroscape and Monsterpocalypse. 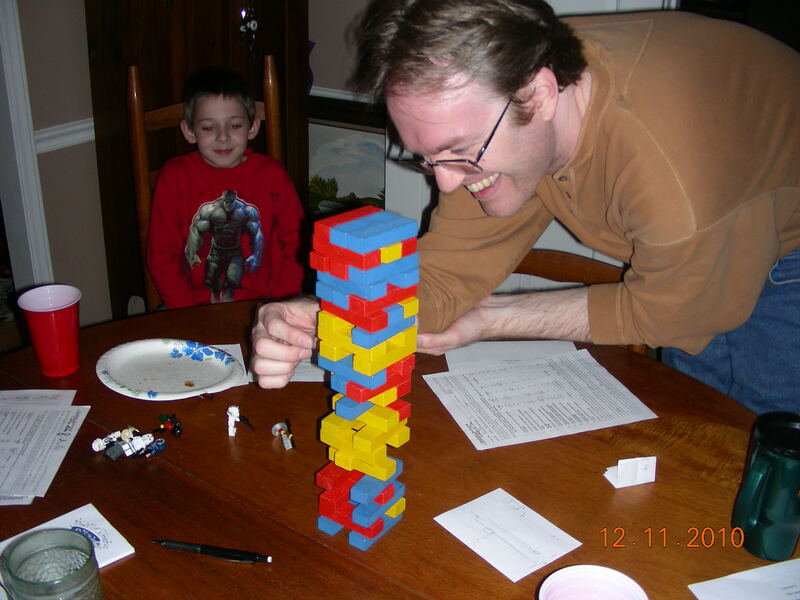 He had just gotten MonPoc and was itching to play it so he and I set up the Voltron version. 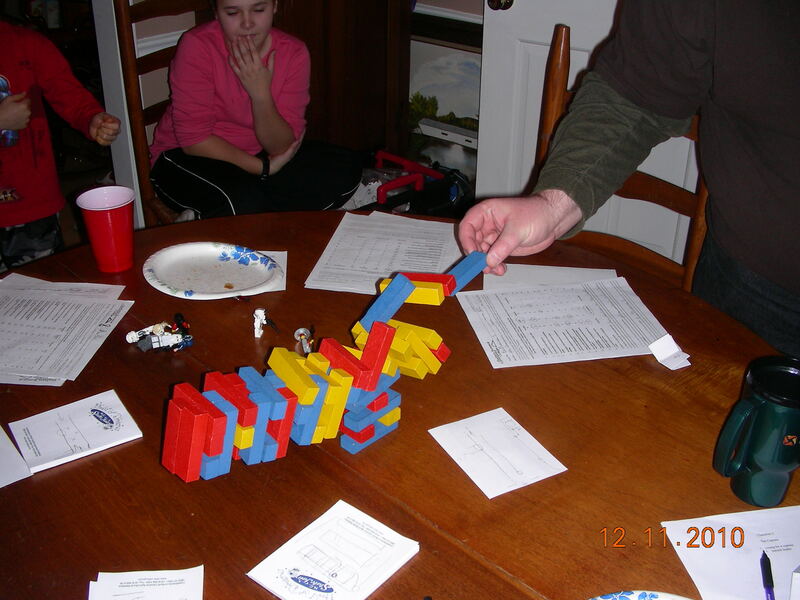 I played Lo-tron and Terry of course was Voltron. 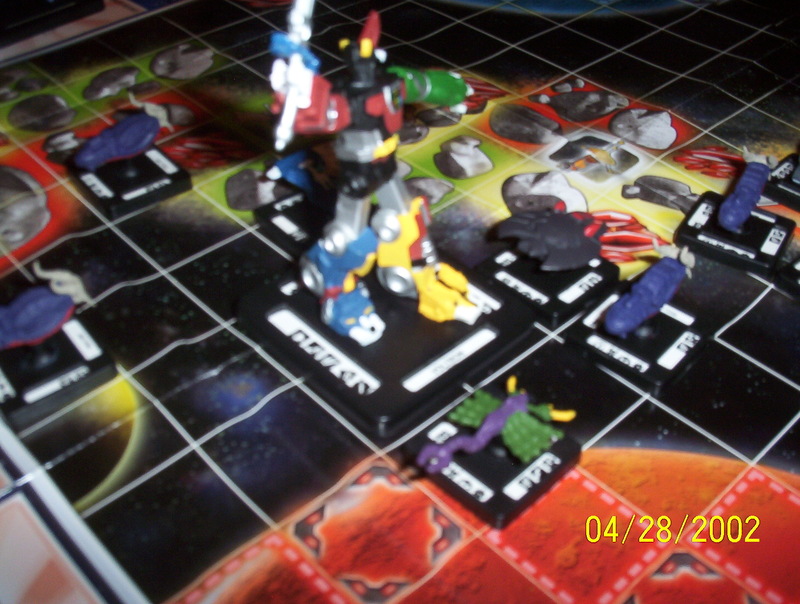 In the end Voltron was victorious. MonPoc is a fun game though it is looonnngg. It plays similar to the Clix games without the clicking. It has a cool dice pool mechanic where your big guy and his units (army) share dice. You get activation dice for destroying units. These are used to power your big guy and to use his special powers. All in all it was pretty neat and I may get a set of my own. While Terry and I were fighting for control of the universe, Cindy, Barry, Olivia, and Zachary broke out Saboteur. Livy taught it pretty well and I think they all had a good time. I believe Barry won. 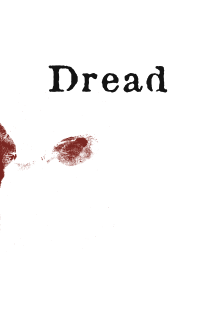 Next was the main event of the day – Dread. I had been playing up Dread for a while and Terry and Barry were really wanting to see it in action. I gave them a choice of scenarios: Beneath A Metal Sky – an Aliens riff, and a homebrew based on an episode of The Gamemaster Show. They chose the first one. They picked their characters and filled out the questionaire for that character. We had The Medic, played by Cindy. Barry was The Captain. Terry played The Navigator. 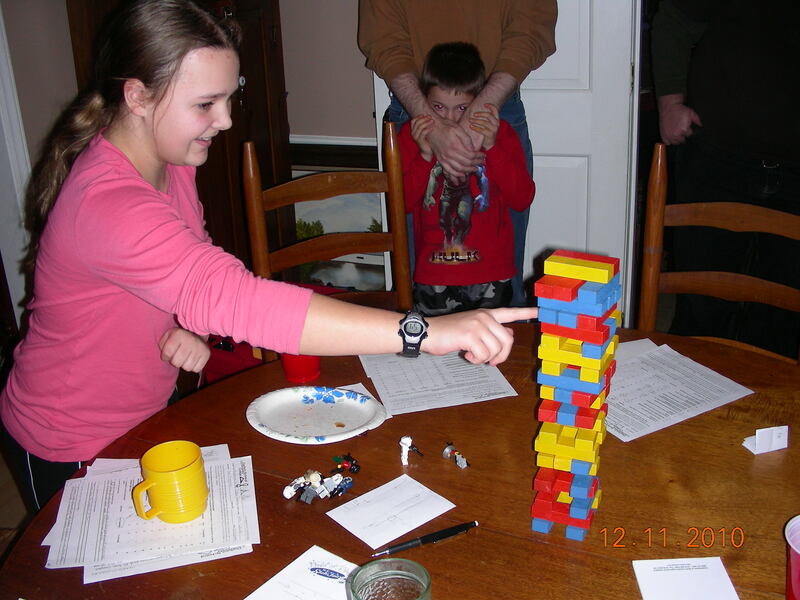 And Olivia played The Researcher. They made up most of the crew of The Jimmy Olsen, Captain Kirk Ford’s ship. They received a distress call from another ship and went to investigate. Everyone but the captain entered the ship (he was a germaphobic). They explored the ship and discovered that the crew is gone. But something was there. And they wanted The Jimmy Olsen. Now the entire crew (the captain joined them) was trapped on the other ship. The crew found out that the captain really didn’t care that much about them. All he wanted was the precious cargo – an extremely valuable ore. He ordered them to help him retrieve it. They decided that their lives were more valuable. They made their way back to the airlock while the captain headed to the hold. Bad move on his part. He found his valuables but also the queen and king of the creatures. In the end, the captain sacrificed himself to save the others. They escaped. Dread was very successful. We had a huge blast. 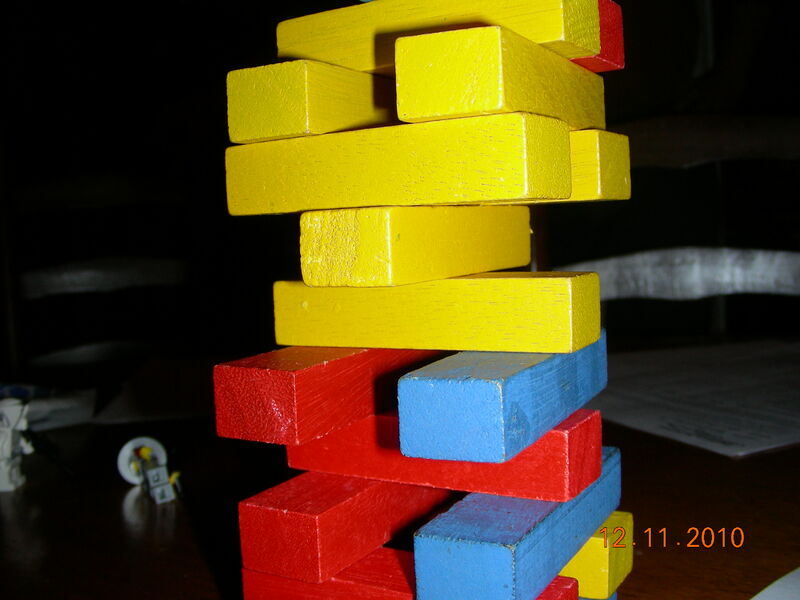 Terry proved himself the Jenga master. The gang was so lucky. The tower did not fall. We had three single blocks at the end when Barry made the final pull to blow himself and the creatures to pieces, saving his crew. Everyone agreed that Dread was awesome. But the best thing about this game is that it was Olivia’s first rpg. And she loved it and did a fantastic job playing her character. She definitely wants to play again. 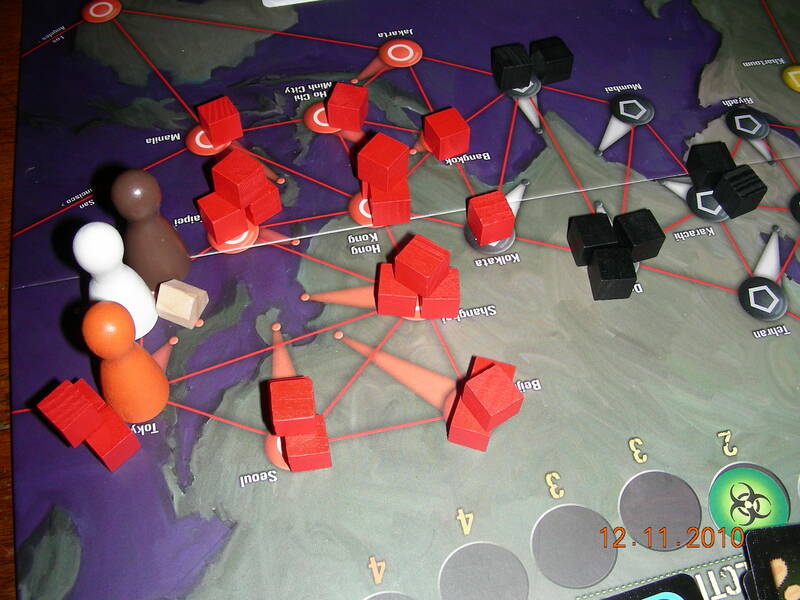 After Dread we played Pandemic. Terry was very much wanting to play this having read so much about it. We barely won with only two player turns to go. Pandemic is such a fantastic game. It always provides a fun time filled with tension. It is just elegant. 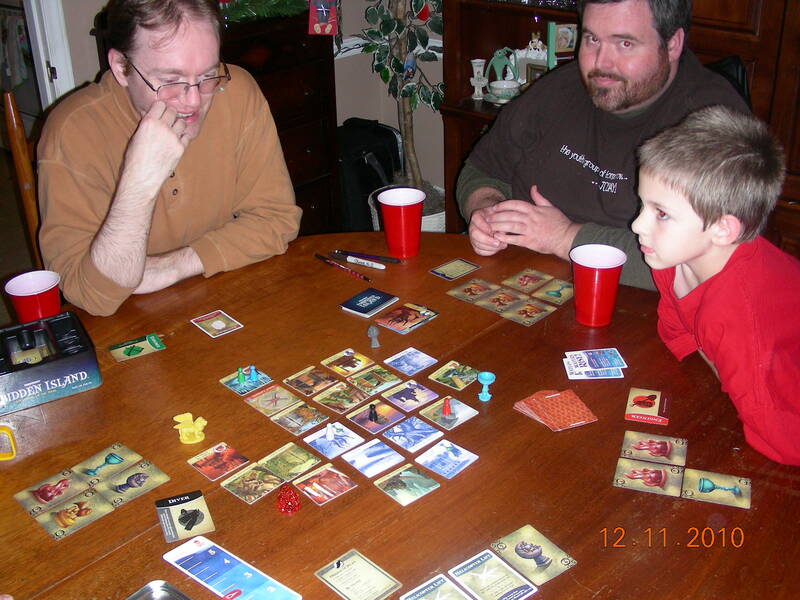 Next up was a quick game of Forbidden Island. Again Matt Leacock comes through with a winner. The kids and I knew it was good but Terry and Barry were pleasantly surprised. Unfortunately we lost the game. Gameathonapocaloozafestacon 2010 #1 was a big success.